As our team searches through many square kilometres of often heavily forested, dense and challenging terrain (determined to locate a small group of quiet, agile, and cryptic monkeys), more often than not we hear our subjects long before we see them; juveniles crashing around in the morning canopy; the squeals of insistent infants; or the unmistakable screams that signal the start of trouble. There are rare occasions however when the search is aided by a wholly unexpected suite of sounds. As we approached the top of Big-Valley we were met by a cacophony of noise so dissimilar to any that we were accustomed to that we wondered if we were hearing monkeys at all. The noise began to separate into distinct components at the foot of Vertical-Valley and it soon became clear that it was indeed a group of monkeys, repeatedly ‘fear’ screaming, yelling, and growling, and above it all a single insistent juvenile distress call. 10 adult members of the Green Group were surrounding a low holly bush, patrolling the ground around it and the trees above, whilst the remaining members screamed and clamoured around at various distances, all focusing their attention towards some poor unfortunate cowering within. This situation would have been unusual even had the individual under siege been a transgressing group member, or some foreign interloper; to see so many individuals aligned against only one other with such insistence and sustained ferocity. In this case however the target was a member of a different species altogether. Crouched under the bush, occasionally hissing and spitting at the approaches of its persecutors was a large, extremely stressed cat; its ears and right eye damaged and bleeding. The cat remained trapped beneath the bush for 7 or 8 minutes after which it made a break, revealing a large body and a distinctive ringed tail, only to be harried back under a different patch of undergrowth. 25 minutes or more passed like this with the cat suffering repeated approaches and threats from an occasionally surprising suite of individuals: It was no surprise to observe both George and Artemis at the front of the attack, approaching to within half a metre at times, but once Artemis had retreated, even Noddy handed “his” infant over to Artemis and took up position at the edge of the bush. Even Joan, clutching her infant, made attempts to flush the cat from cover by rushing past Lewis, Mac and Simon, towards the bush at speed. This pattern continued until the group began to disperse and take back up their previous activities, leaving only a few individuals surrounding the bush, who also dispersed shortly after. At this point the cat’s shuddering breathing seemed to return to something resembling normality and we made the decision to leave also, in order to allow it the possibility of escape without any further interference from us. As such we retreated some distance and sat patiently, hoping for another glimpse as it made its way to better cover, but rather predictably (and pleasingly somehow) for a cat it simply vanished into the forest, leaving behind only a few clumps of hair, rent during the attack. 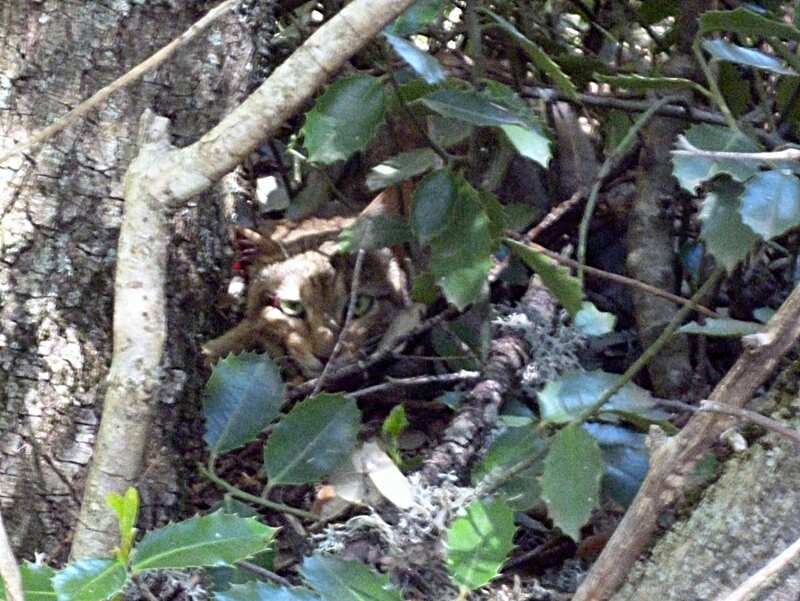 Having seen the body size, ears and tail, and given a little time to think we began to realise that this was not some poor cat lost in the forest but rather something a little more exotic; we believe that what we observed was the mobbing of an African Wild Cat (Felis silvestris lybica). But to what end? The cat had clearly defended itself during the encounter, as evidenced by the bloody mark and missing fur on Helen’s back, and by the strange injury seemingly inflicted on Simon’s left hand; he was clearly uncomfortable using his hand at all for the remainder of the day, and by the following morning he was unable or unwilling to use it at all. Remarkably however, following 4 days of inactivity the hand was almost completely healed and with the exception of a little limp for another 2 days his hand appears fully healed.